You are currently browsing the MSBLOG weblog archives for December, 2008. TechNet MSDN Technology Summit is coming to Kuala Lumpur! After 3 years of absence in Kuala Lumpur, TechNET MSDN Technology Summit is back! This event will be taking place in Kuala Lumpur Convention Center (Malaysia) on the 15th January 2009. For the very first time, we’ll showing a 2 hour Microsoft client and server platform demo-relay and *drum roll* a sneak preview of Windows 7! Go to www.microsoft.com/malaysia/events/technetmsdn/ to reserve a seat. Please note that agenda(especially keynote) in the website is not updated, we’ll have the website updated with finalized topics by end of this week. 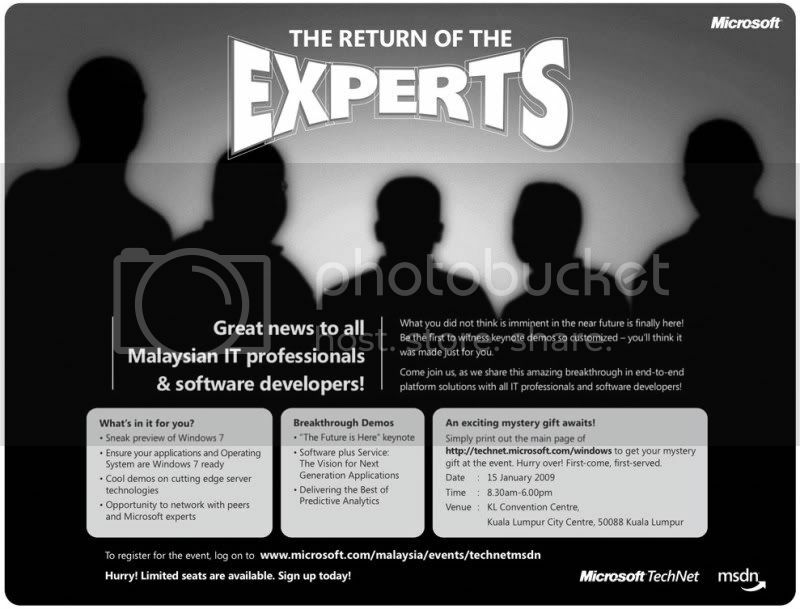 Posted in Events | Comments Off on TechNet MSDN Technology Summit is coming to Kuala Lumpur!